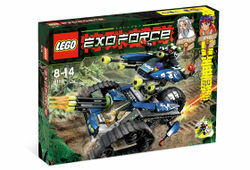 8118 Hybrid Rescue Tank is an Exo-Force-themed set released in 2008. It includes 339 pieces and two minifigures, Sensei Keiken and Ryo. The upper half of the vehicle can separate to make a flying attack vehicle and the Mini-bot can detach from that. The six-barreled gun next to Sensei Keiken revolves when the tank is pushed forward. A very wide and long tinted canopy cover provides the minifigure within a panoramic view. For the first time in Exo-Force, the canopy/windscreen cannot simply rotate out of the way. Inside the cockpit- like Hikaru before him in the Chameleon Hunter- Ryo has no seat to rest on, planting his hollow legs right on the floor of the vehicle. He hangs onto an extended handlebar which is connected to the nose via a single Battle Droid minifigure arm seen in many Star Wars sets since 1999. On either side of the canopy are two of plasma-burst cannons. The black shafts used for almost all of the cannons in the set are the same ones that run through the center of all of the human-made mini-robots in the line (including the one for this set). Underneath the long streamlined tail is the engine for the fighter. Because of the parts that are used, the engine nozzle can easily twist around. Both wings are identical and attached to the body with ratcheting joints. The long smooth blue parts used for the wings are the same ones used for the fighter’s tail. Each also features a thin extended-barrel plasma-burst cannon, both of which have their own identical ratcheting joints as well. Mounted above each wing on a ball-and-socket joint is a single missile launcher. A pair of neon-green slanted 1x2 vent plates sit on either wing right below the missile launchers. Most of the parts that have to do with the framework are dark grey. This set was designed by LEGO Employee Mark Stafford. The fact that Sensei Keiken is included, suggests that the team was successful in rescuing him from Meca One. However, this was never officially revealed, seeing that the theme and the storyline were suddenly halted after this set was released. This is a description taken from LEGO.com. Please do not modify it. With its rotating tank treads, rolling support wheel and rotating gatling cannon, this massive battle tank will rescue Sensei Keiken at any cost! Facts about "8118 Hybrid Rescue Tank"
This page was last edited on 28 April 2016, at 15:43.